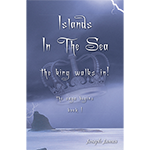 Islands in the Sea: The King Walks In! | Book 1  - $13.99 : Beneficial Zone, Everything is permissible, not everything is beneficial! Every once in a while, someone is chosen. They aren't the one we would normally choose for the task, but then again we aren't the one choosing, are we? It usually happens in the night and all of a sudden it is too late. We are hanging on the edge and there is only one clear choice to make. Are we ready? It really doesn't matter, time has run out! We have to decide, now! Dan goes to sleep as usual, but this is no ordinary night. This night will change his life forever and more importantly, those around him. His choices will affect the lives of everyone he loves. Can he do it? Can he make a difference? Is he up to the challenge? He's just an ordinary man, but now he must be brave, strong and yes, a hero. Did someone say, Hero?